In gunite or sprayed concrete or mortar are conveyed through hose to project pneumatically to a surface at a high velocity which is required to construct or repair work. Sprayed concrete terminology is a term in EU and significantly general. But both gunite and sprayed concrete are nothing but synonym of shotcrete. The properties of ginite are identical that of traditionally placed concrete or mortar having same proportions. In this method significant skill of nozzleman is important. We will discuss about different method of applying shotcrete in our next post. In any method strength and finishing of surface depend especially on control on accurate placing of materials with the help of nozzle i.e. performance depend on skill of operators. ACI certifies the nozzleman for shotcrete operation and we should hire only certified nozzleman for our shotcrete operation. We have discussed where to go to be shotcrete nozzleman and who patronize this certification in our previous posts. You can visit this for more information. 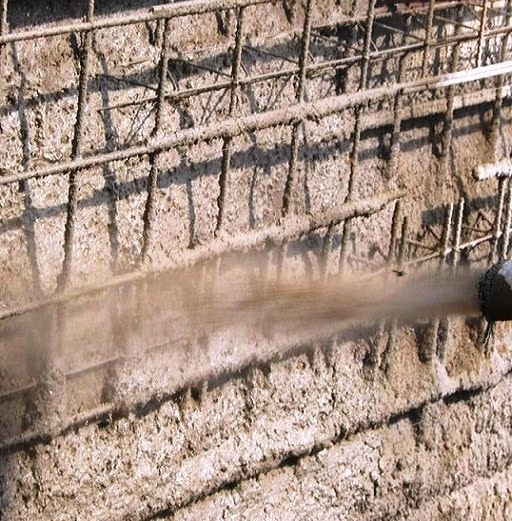 Dear reader we will discuss about application of shotcrete/gunite/sprayed concrete in our next post. Please stay with us.